Between 1948 and 1963, the Lyric Theatre was a thriving entertainment centerpiece for Lexington’s African-American families. Originally built as a movie house, the Lyric opened at the corner of Third and Deweese Street (now Elm Tree Lane) in Lexington. And it quickly became a cultural icon. Soulful sounds filled the theatre with other notable performers including: B.B. King; Wynonie Harris, who wrote Good Rocking Tonight, recorded by Elvis Presley; Mercer Ellington, the only son of Duke Ellington; and Billy Brown, formerly of the Dominos, who formed The Checkers and began recording for King Records. Entertainment wasn’t the only draw. Numerous small black-owned business – from clothing stores to ice cream shops – were launched in and around the theatre. Before closing in 1963, the theatre returned to its roots as a movie theatre, featuring horror films and black cowboy movies plus Saturday morning cartoons. Tee Dee Young picked up the guitar as a young boy and hasn’t put it down since. Growing up in Lexington, Tee Dee was mentored on guitar by an elderly musician, and picked up his vocal skills from his father, who was a gospel singer. Tee Dee’s singular blues style has made him a favorite of blues fans, both here in Lexington and on stages across America and Europe. 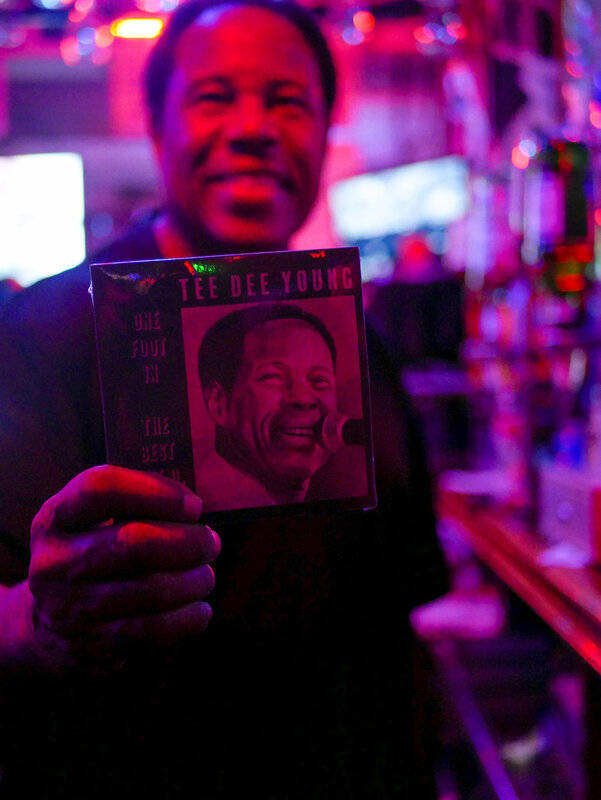 On Monday nights, Tee Dee and his band play to an appreciative crowd at his club on East Second Street in downtown Lexington. Young recalled the beginnings of the Tee Dee’s Blues Club. He bought a building and renovated it. He recalled the poor condition of the building when he first got it. “You’d rather stay outside than in the building because it was raining in the building more than it was outside,” he said with a laugh.